Will PS market soften in Europe? 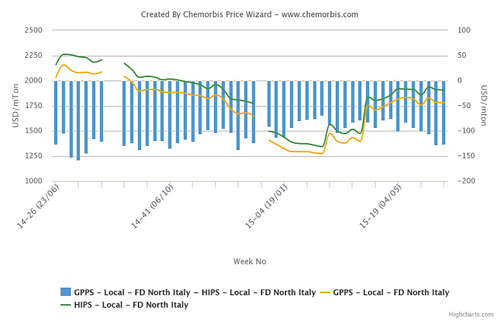 In Italy, players reported stable to €20/ton softer levels for overall spot GPPS prices during this past week while HIPS prices tracked mostly a steady trend as per ChemOrbis pricing service. The €20/ton drop was for a non-European origin and when excluding this price, the GPPS range also tracked a steady trend. However, sellers had previously started the month of June on a firmer note on the back of the €20/ton increase in June styrene contracts on FOB NWE basis, before an FCA based styrene contract came at a rollover. European PS sellers were initially targeting €30/ton June hikes but buyers were resisting these requests, pointing to the relentless increases that the PS market has been recording since the beginning April and complaining that they are not able to reflect these hikes to their end product prices. These PS increases were stemming from firmer styrene costs, which were triggered by scheduled shutdowns in the region. Although the shut capacities were not large in numbers, the cumulative capacity of the off-line plants was over 1 million tons/year and higher costs pushed sellers to seek increases. As these capacities started to resume operations, the spot styrene market also changed direction. Last week, Trinseo restarted their 500,000 tons/year styrene unit at Terneuzen, the Netherlands after a maintenance shutdown that started in mid-April. The current spot styrene costs are down $80/ton when compared to the previous week while they are $100/ton below the early June levels in the region. Nowadays, June PS deals are mostly reported at rolled over levels in Italy as sellers started to step back from their initial hike targets. Apart from the declining styrene costs, overall PS demand is also weak in the country. Some distributors report selling West European PS at rolled over levels while admitting to conceding to small discounts of €10/ton for some cases. Buyers comment that overall supplies are comfortable while they receive phone calls from distributors who have some stocks left. 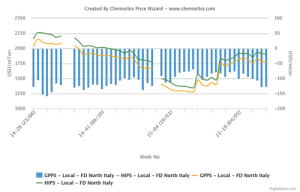 According to ChemOrbis, considering the current market state, if spot styrene does not change direction again, the PS market is likely to retain its steady trend over the short term before the summer holidays start to cast a shadow on the market and pull down prices.